Revitalize the appearance around your eyes! Natural consequences of aging can make us look and feel older than we would like. Thinning skin, sun damage and facial expressions take their toll on the delicate eye area resulting in common cosmetic problems which can be experienced at any age. Rejuvenating the area around your eyes brightens and refreshes a more youthful appearance for your entire face. Botox/Dysport, anti-wrinkle injections used to gently erase or soften crow’s feet or laugh lines around the eye. Injections can also be used to help raise a heavy eyelid. 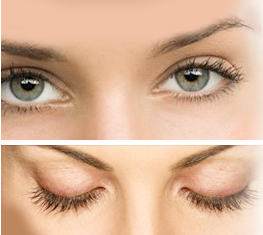 Latisse, an at home eyelash growth stimulation treatment used to promote thicker, longer and stronger lashes. LaseMD Laser, provides gentle skin rejuvenation using a Fractional Thulium laser to revitalize and refresh the delicate area around your eyes. This treatment delivers direct heat energy through micro-channels to the dermis to stimulate your natural collagen and elastin production minimizing crow’s feet and wrinkles. Dermal Fillers, when appropriate restores lost volume and regrows collagen in the hollow area under the eyes. Medical Grade Eye Creams, such as DEJ Eye Cream, DefenAge 3D Eye Radiance Cream and PCA Skin Ideal Complex target the delicate area around the eye to strengthen the tissue, increase collagen and elastin, reduce fine lines, wrinkles, puffiness and brighten the under eye area.